A HIGH QUALITY & DURABLE GLASS JAR - AT HG Our Goal is to Provide You with the Highest Quality, Premium Glass Jar. Have No Fear, This Jar is Built to Last! If you're going to invest in a premium storage jar, it's important to make sure you're not only protecting your goods but also maintaining the humidity inside the jar. That's why we provide a Boveda Humidity pack with each jar you buy to ensure your goods stay fresh. The pack is a 8 gram 62% Humidity Control device that maintains the moisture and humidity within the jar at perfect levels. Even with Ultraviolet Protection, the insides of a container can become a dry environment. The only way to ensure the perfect humidity levels are maintained is with a humidity pack. Each jar is built with an airtight lid seal allowing no smell to escape and preserving the contents within the jar. The container looks professional in your home or kitchen and gets the job done perfectly. The is durable, sturdy and built to last. Unlike most glass, Miron Glass is thick and designed to withstand drops and falls. 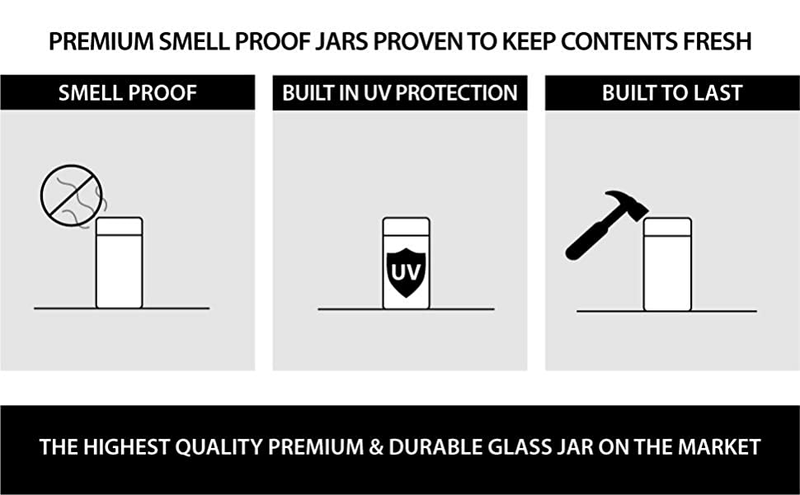 We want to give our customers and experience and present a timeless jar designed for premium protection. With the HG jar you can enjoy a Premium Storage Experience without worry or hassle. How Big is This Jar? It is 250ml or a half ounce in carrying capacity. It measures at 4 inches by 3 inches diameter. How Long will it keep my contents fresh? The jar is proven to keep your goods fresh anywhere from 6 months up to 1 year. How is this different from a regular mason jar? The Herb Guard jar contains ultraviolet properties which block harmful UV rays as well as allow UV-A and infrared light allowing the jar to maintain the lifespan on anything you store inside. Yes, we offer a 30-day, 100% money back guarantee on all products. The packaging and box design has a classy wood grain finish with a sleek design. It is shipped in a plain box with the professional packaging design inside. Is the jar durable? What happens if I drop it? The jar is made from 100% miron glass and is very thick and durable. Many customers have mentioned they dropped it without any issues.